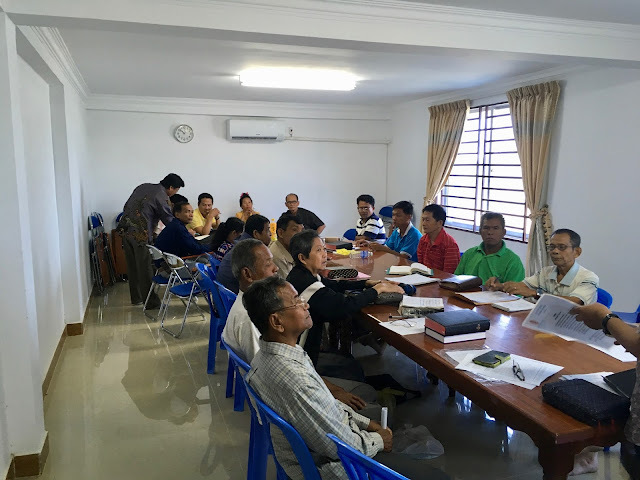 Last week, we were invited to attend a meeting of the pastors that make up the leadership of the Cambodia Baptist Union. These pastors, from all over Cambodia, come to Phnom Penh once every month or every other month to pray for each other, fellowship and discuss CBU business. We enjoyed attending this meeting for several reasons. First, we have been wanting to meet more of the pastors that we will be working with in the future. These connections should prove valuable as we transition into developing more ministry projects. Second, we were encouraged by the fellowship of these pastors. We worshiped together through song, through prayer and through hearing about the things God is doing through each of their ministries. Finally, we appreciated hearing their prayer requests. We have been praying for these pastors for a long time now, but to hear them share their requests directly made us feel even more a part of the work they are doing. We were honored by the invitation to join (especially since it means that everybody thought our language skills were finally good enough to mostly keep up), and we hope that this is the first of many opportunities to encourage and be encouraged by our fellow Christian workers.